They stand out wherever they go and now India’s tallest family is hoping to set a new world record with their combined height. The Kulkarnis, from the city of Pune in the east of the country, tower above their countrymen. 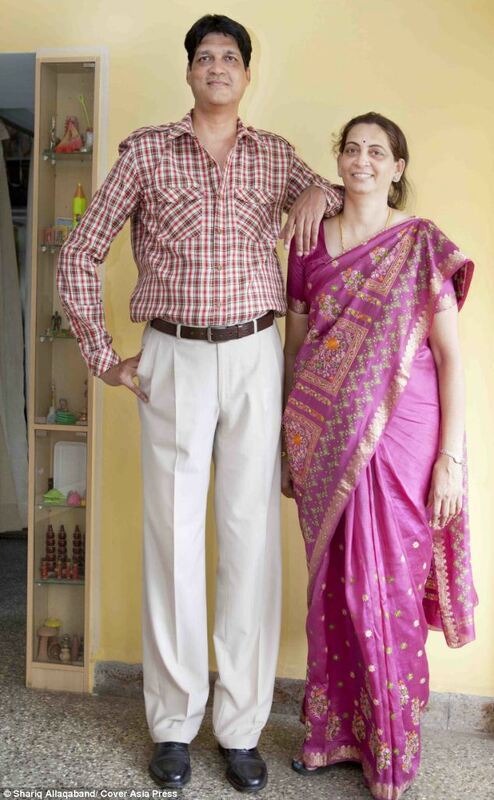 Sharad Kulkarni, 52, stands at 7ft 1.5ins tall and his wife Sanjot, 46, is 6ft 2.6ins tall. Their daughters Mruga, 22, and Sanya, 16, are 6ft 1ins and 6ft 4ins respectively. The family’s combined height is a staggering 26ft. Mr and Mrs Kulkarni were crowned India’s tallest couple by their country’s Limca Book of Records after they married in 1989. They had hoped to be named the world’s tallest couple by the Guinness Book of Records, until it emerged that Wayne and Laurie Hallquist, from Stockton, California, stand a combined inch taller at 13ft 4ins. Growing up, Mr and Mrs Kulkarni faced years of teasing and ridicule. When Mr. Kulkarni hit 7ft as a teenager he ploughed his energies into sports and ended up playing basketball for his country. But Mrs. Kulkarni struggled to go unrecognised and fit in in the remote Indian village where she lived. The pair began to accept early on in their teens that marriage one day might be difficult. 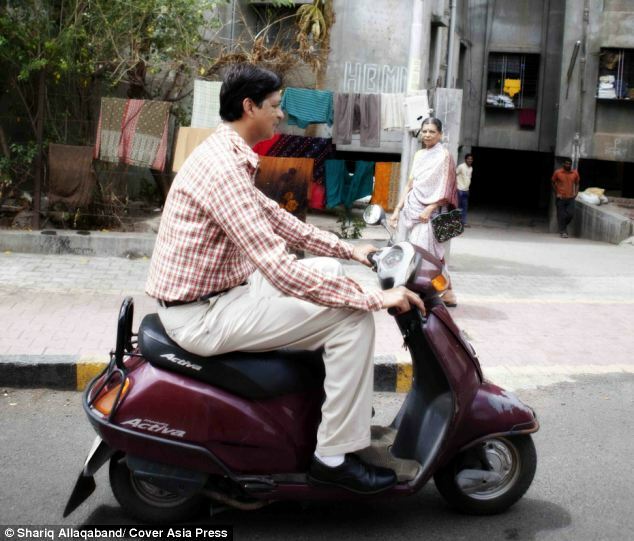 Mrs Kulkarni said: ‘It’s hard for a woman to be taller than a man in India. The man is the more authoritative role so I would never want to marry a smaller man and then him be ridiculed about his wife. But Mrs Kulkarni’s grandmother spotted Mr Kulkarni walking down a street in Mumbai one evening and approached him. Mr Kulkarni said: ‘This older lady came up to me and asked if I was married or single and would I meet her granddaughter who was over 6ft. A few weeks later Mr Kulkarni’s parents called the number and a meeting was arranged for the potential couple, as is traditional in India. Mr Kulkarni, who works at a bank, said: ‘Many women have claimed they’re 6ft but then, when we meet they’re only about 5ft 10ins and too small for me. The couple married in December 1988. A year later Limca Book of Records pronounced them India’s tallest married couple. Now, along with their two grown-up daughters Mruga and Sanya, they hope to have the chance to be the world’s tallest family. Mruga said: ‘I’m so excited. We love being tall. Both Mruga and Sanya want to be models and hope that their height could give them a huge advantage in the industry. Mruga said: ‘At the moment we’re studying and working hard on our exams but we’re trying to apply to model agencies and build up a portfolio. The Kulkarnis have wardrobes full of custom-made clothes and shoes. Shopping on the high street is impossible. Their shoe sizes range from 8 to 12 and they often order their footwear online from Europe. Their house has been adapted to meet their needs – they had to change all the door frames from 6ft to 8ft high. They have customised their furniture including beds, wardrobes, kitchen shelves, and even the height of the toilet. But they never use public transport, preferring to travel on scooters. When flying is necessary, they ask for a front seat or emergency exit row. Guinness Book of Records does not currently have a tallest family category but would consider it.